When you start a business, it’s easy to underestimate how often you need a graphic designer. There’s your logo, business cards, brochures, website graphics, and banners for social media profiles – and that’s just getting started. You’ll inevitably want to update all of these designs to stay current, and there’s always more than needs to be done. 1) Do it yourself. There are a lot of free or low-cost tools out there that can help beginners create great designs. However, this means you’re spending time learning new tools and creating graphics when your time is much better spent doing what you do best. And if you don’t have an eye for design or you’re not tech-savvy, this option can be incredibly frustrating and the designs may not look as polished as you’d like. 2) Pay a freelancer whenever you need a project done. If you want a professional look, you’ll have to hire a professional for the job. It can be a long process to find someone who gets your vision at a price you can afford. And if you’ve never worked with a designer before, it can be a bit of a learning curve to figure out how to best communicate your vision. When you do find someone you like, you tend to be very conservative with how many projects you send to them because getting a new design feels like a luxury or unnecessary expense. 3) Rarely (or never) update your designs. I’m definitely guilty of this. You run out of time to do the designs yourself, and working with freelancers can be a huge drain on your budget. Over time, your designs start to look dated and you probably don’t even realize how much it’s truly affecting your bottom line. 4) Use a flat-rate, unlimited graphic design service. This means you can send all the graphic design projects you want for one flat price! The one I’ve tried (and recommend) is Design Pickle. No more trying to figure out how to use graphic design software (you’ve got more important things on your to-do list!). No more holding back on design projects because you’re worried about the cost. And you can finally refresh your look without blowing your budget. I love sharing things I’ve tried and would recommend to friends and family. Note that if you sign up for this service, I may receive a small commission that helps support this page. Sign up. Try their service risk-free for two weeks. If it’s not a good fit, you get a 100% refund. There’s really no reason not to give it a try! Tell them a little about your business. Design Pickle will match you with someone they think will be a good fit for your industry and the projects you’re looking for. Send your project ideas, any time day or night. Get your designs back as early as the next business day. Incredibly easy to work with. They walk through everything step-by-step. They make the process very straightforward and painless. Skip the hiring process. I didn’t have to worry about finding a good designer, interviewing candidates, checking references, and all the work that goes into hiring someone new. Clear, quick communication with the designer. I never have to worry about following up to see where my design is. Fast turnaround. With other designers, sometimes I had to wait for an opening in their schedule. With Design Pickle, I get my finished designs as soon as the next business day! Not only that, my designer often sends multiple versions so I can choose which option I like best. Unlimited revisions. Many times when I see the final product, I start to notice things I want to change. Now I don’t have to worry about any extra fees for revisions. The sky’s the limit! I don’t have to hold back on my design ideas. Whenever I have an idea, I can just add it to the queue. I no longer have to worry that hiring a designer for another project will put me over budget. As with anything, there are a few downsides. You won’t be able to hop on the call with your designer and brainstorm ideas together – everything must be done by email or through their website. This means you’ll need to have a good idea of what you want and communicate that well with your designer. The more specific you are, the better. That said, I’ve sent my designer some text and a few designs I liked and he put together something that I loved! Basically, if you can describe it in an email, they’ll design it. Get started creating awesome designs! Check out Design Pickle and see if it’s for you. As I mentioned before, you can try them risk-free for two weeks. 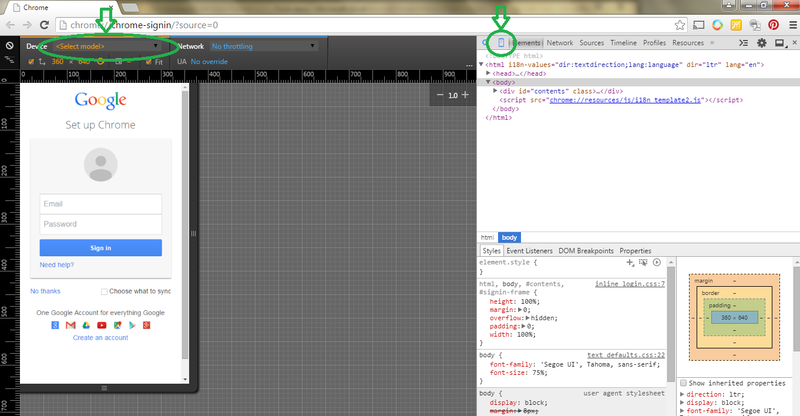 That’s plenty of time to get to know your designer and get a few projects done to see if the service would be helpful. If you submit one project every business day, that’s 10 designs during that two-week period! Give your business a refresh – you deserve it! And I think you’ll be pleasantly surprised at how great designs can bring more credibility, trust, and sales to your business. As with just about anything, there is no one-size-fits-all solution. It all depends on your goals. 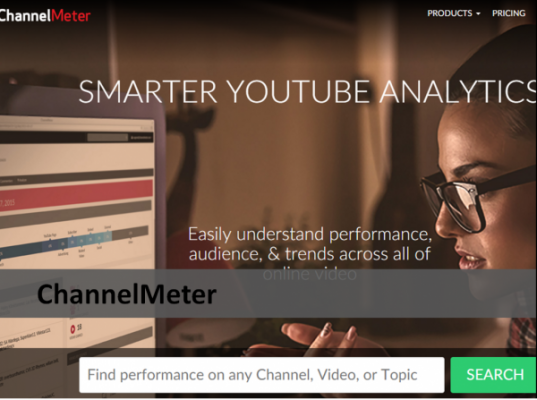 In this list you’ll find tools to help you take a deeper look at your audience, see which posts are getting the most traction, compare your page to others in your field, get specific recommendations for improvements, and more. If you ever asked yourself: Am I posting frequently enough? Is my engagement rate on par with other similar pages? What time are my Facebook fans online? Who’s engaging with my posts? What kinds of things should I post on Facebook? Wonder no more. 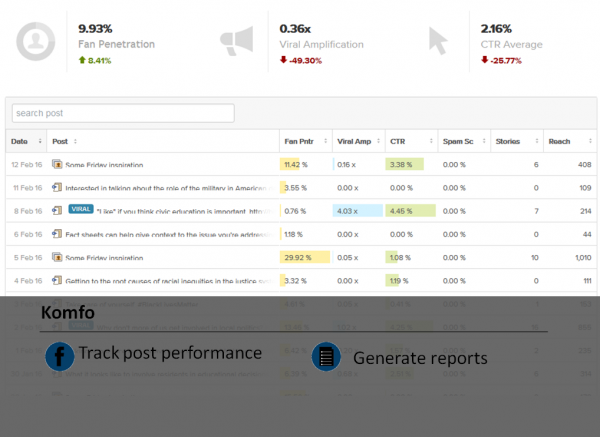 This is a handy free tool can help you see if you are on par with other pages for key areas such as posting frequency and engagement rate. 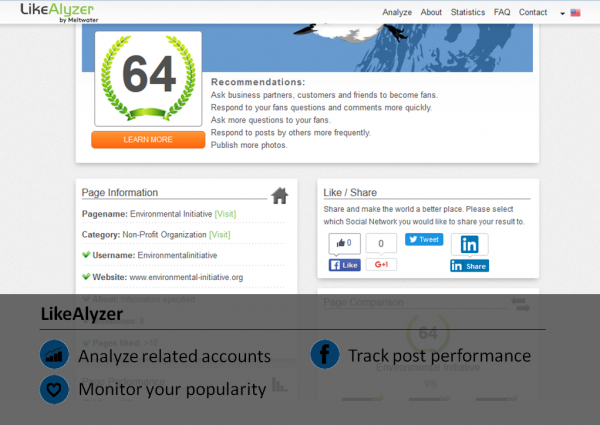 It will analyze your public Facebook page and give you specific recommendations as to how you can improve. You can also plug in Facebook page urls for other organizations in your field to see what they’re doing right so you can learn from them. Use this tool to quickly see your likes, comments, and post impressions during the previous week. They also have a heatmap feature to see exactly what days and times your Facebook fans are online. Upgrade to pro starting at $90/month to get advanced insights such as recommendations of which keywords to use to increase engagement, the optimal post frequency for your page, a comparison of your page to industry averages, and see your most successful photos. 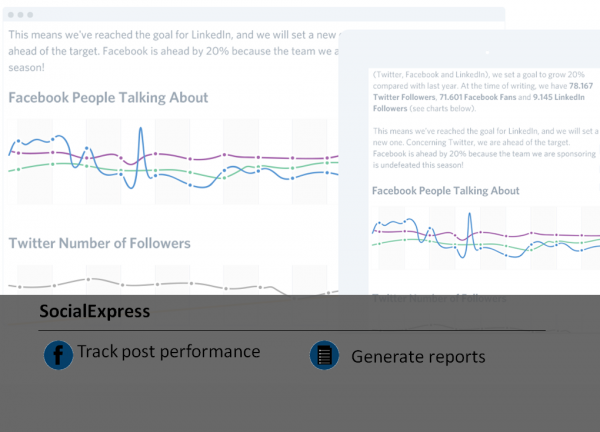 This tool will help you generate reports on your Facebook stats that will look way cooler than anything you could put together with a spreadsheet. And if you’ve already put a ton of information into spreadsheets, just upload them into their system. 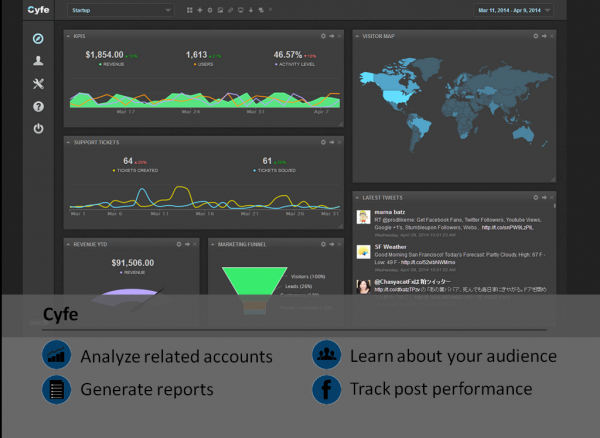 Create charts and visuals to show your engagement rate, number of fans, organic and paid reach, viral reach, and more. 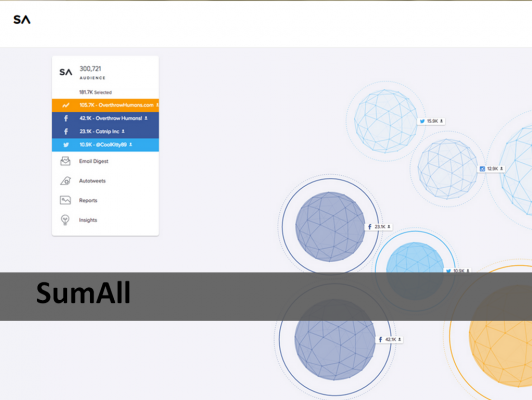 Drag and drop visual elements and screenshots of your Facebook posts directly into the report. 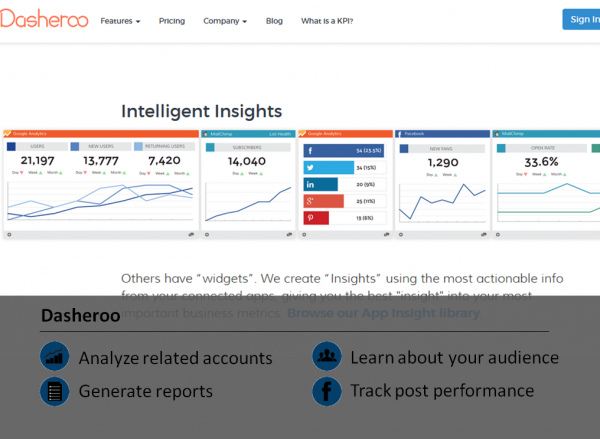 Komfo has a simple free tool to help you analyze your posts. 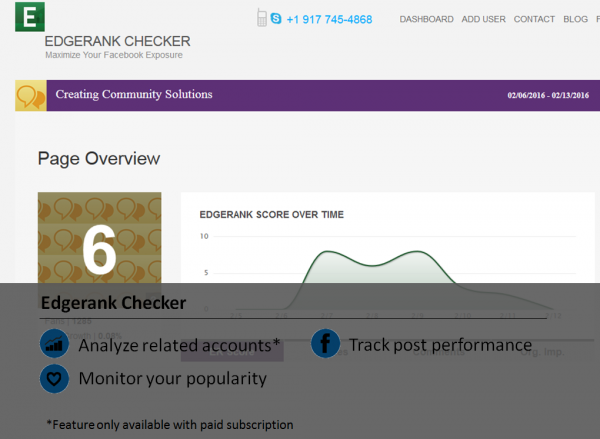 Quickly see how your page compares to the average interaction rate on Facebook. See stats from the last 30 days on fan penetration, viral amplification, CTR, spam score, stories, and reach. Sort by any of these metrics to see your most and least popular posts. You can also email the report to anyone you’d like. 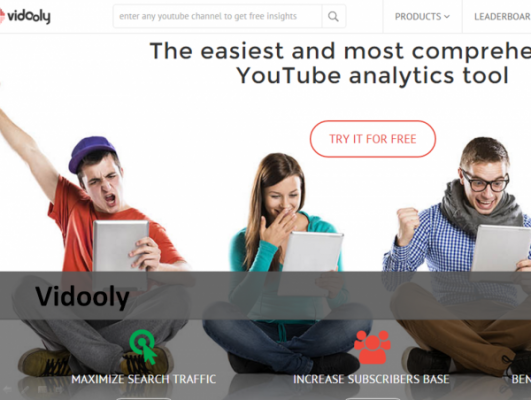 This is a free tool they offer, and they also have a whole suite of social media tools to explore. 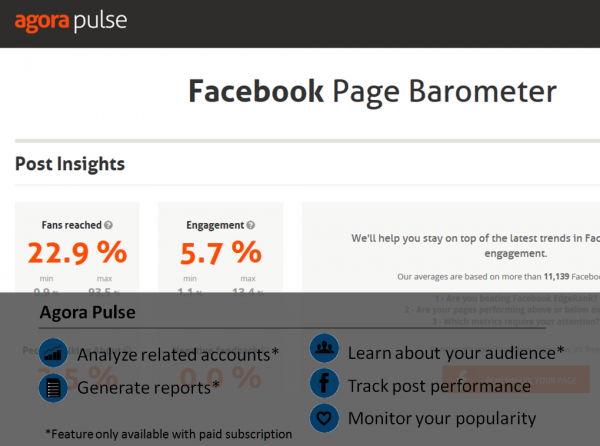 This Facebook Page Barometer helps you see how your page compares to the average page activity across Facebook. See stats for the percentage of fans reached, engagement, negative feedback, and more. Upgrade to their paid plans starting at $29/month to access advanced features such as publishing, reporting, ad monitoring, and competitor comparison. You’ll also be able to connect your Twitter and Instagram profiles to manage all three profiles in one place. 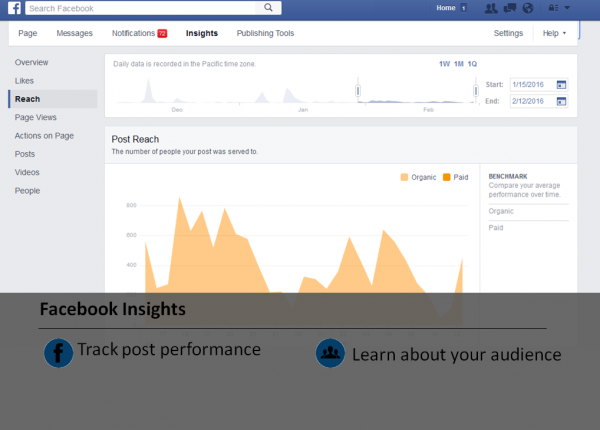 Use this tool for free reports on your Facebook fans and post performance including analysis on insights, competitors, content, and page performance. 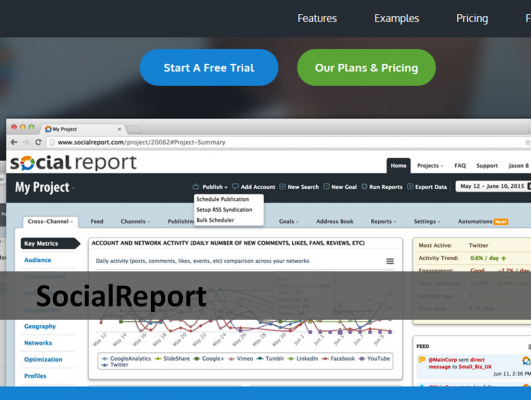 They also have several other free reports for other social media channels. Monthly subscriptions for premium reports start at $500. Their newsletter has a lot of useful tips and guides and is worth subscribing to even if you don’t use their services. 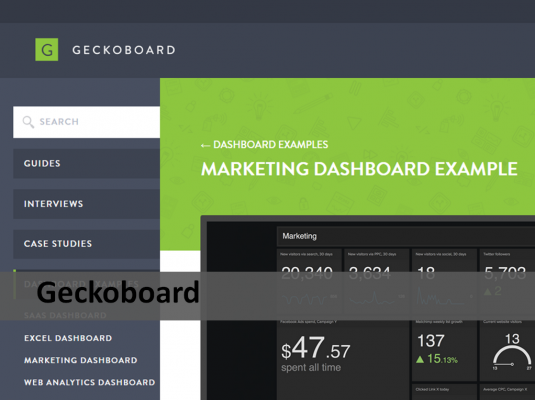 This dashboard will help you visualize a TON of information about your Facebook fans and what you’ve posted. 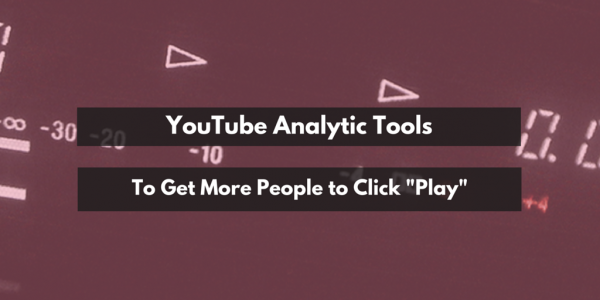 See trends in clicks, likes, check-ins, reach, overall performance, and more. Dig a little deeper and see your reach and check-ins alongside with demographic information so you know exactly who is seeing your posts and interacting with you. No need to stop with Facebook – this tool will help you track information from many profiles all in one place. Cyfe gives you a limited number of “widgets” on their dashboard for free, or upgrade for $19/month for unlimited data. 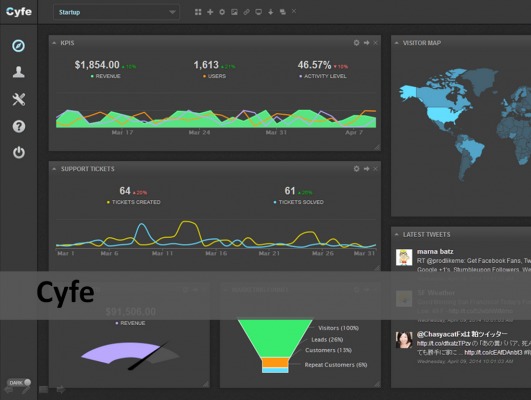 This is another dashboard to help you see all your important stats in one place. 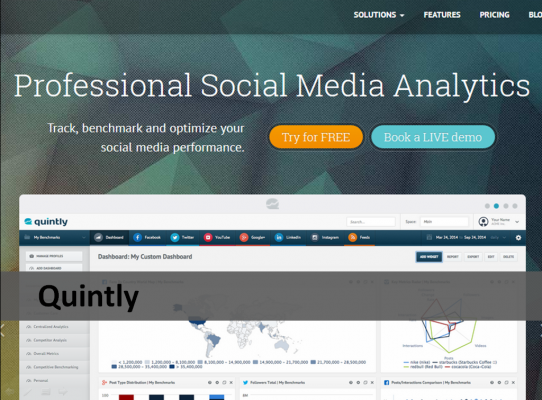 This tool has many in-depth analytics displayed in an intuitive way. Learn about your post consumption by type, organic vs paid reach, posts with the highest engagement, and more. 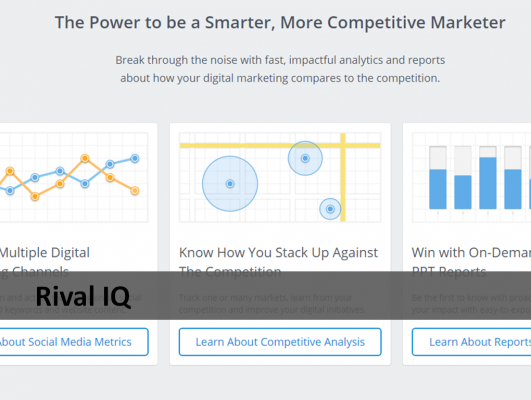 You can also compare your page to your competitors for a bit of context. Set up alerts when your stats hit a certain threshold, and export the dashboard to use it in other place. 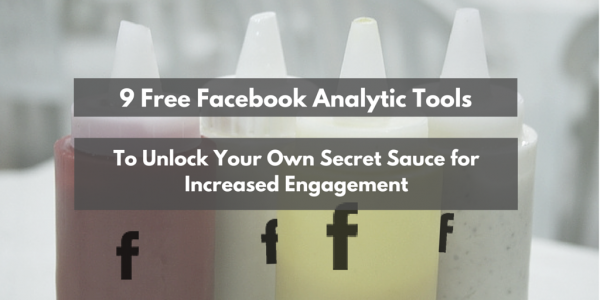 You don’t have to only monitor your Facebook analytics – use this tool to see insights for many profiles in one place. 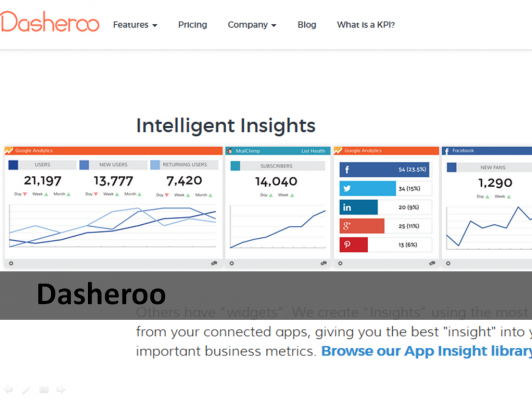 They offer a free plan with 12 data insights, 4 dashboards, and a 30 day data window. Premium plans start at $19/month. Don’t forget that you can get tons of great information (also for free!) from Facebook itself. 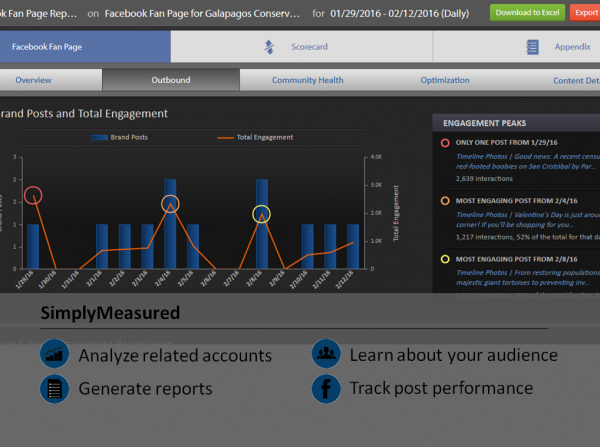 Get insights for likes, reach, page views, video, demographic information, and actions people took on your page. Some of this information only seems to be available via Facebook Insights vs third party tools, so be sure to check out your stats here from time to time even if you prefer another tool. 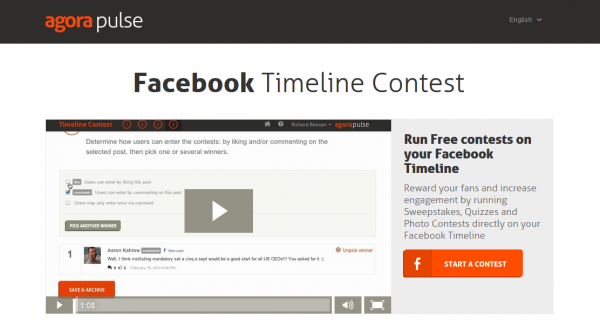 Facebook contests are a great way to engage your followers. Fortunately, Agora Pulse created a free tool to do most of the work for you. Whether you’re doing a sweepstakes, quiz, or photo contest, this tool will make it easy to run your contests on Facebook. It can be hard to know what kind of content your audience will like, and we don’t often always have time to scour through Facebook pages, blogs, and RSS feeds to find things to post. That’s where this awesome free tool comes in. 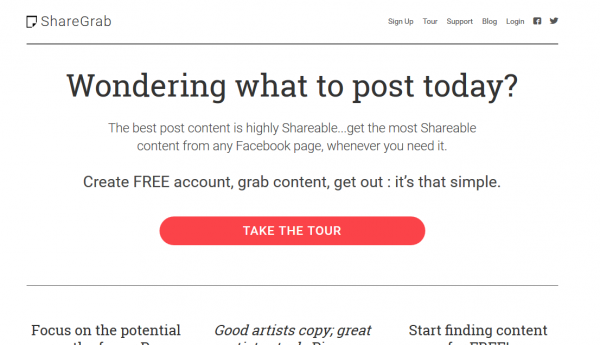 Choose pages that post things similar to you and ShareGrab will search those pages to find the most successful posts. The great thing is, this content has already been tested with an audience similar to yours, so you’ll likely see a higher engagement rate with these posts. I could get lost in Pinterest for hours! There is always more to see and discover. One thing I love about Pinterest as a social media tool is that it is a great place to share evergreen resources. Even so, it’s important to continue to add content on a regular basis. As you can imagine, this is much easier to do with a scheduling tool. 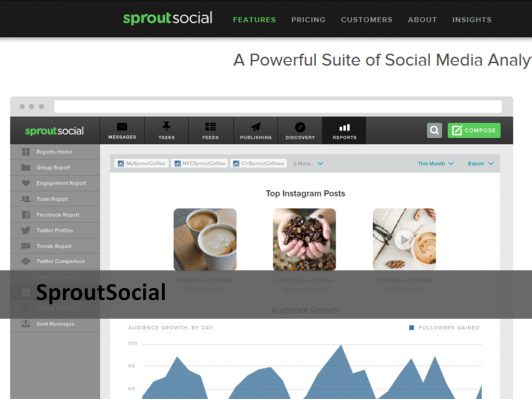 One of my favorite social media management tools also integrates with Pinterest! 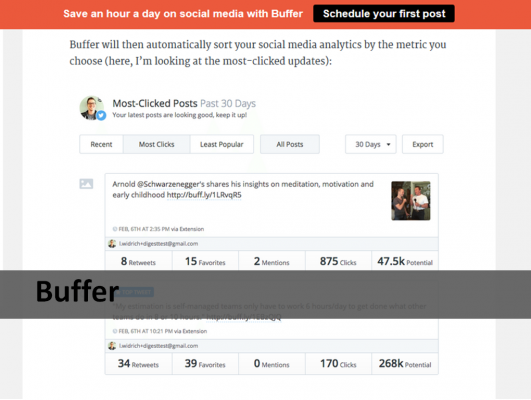 Use Buffer to collaborate with your team members to post not only to Pinterest, but also to Facebook, Twitter, LinkedIn, and Google+. There are two features of this tool that I love: 1) You can integrate your pins with Google Analytics Campaigns to track your progress, and 2) Their tool “Pablo” can help you create shareable images without leaving their website. They have a free version to manage Facebook and Twitter, but you’ll have to upgrade to post to Pinterest. Even so, it’s a very affordable tool starting at $10/month. Plus, they have discounts for nonprofits and their customer service is excellent. This is a fairly new scheduling tool on the market. It doesn’t have as many features as some of the other options, but at $5/month the price can’t be beat. If you have a lot of pins ready to go, use their bulk upload feature to get started quickly. You can also pin to multiple boards and clone pins to increase your productivity. I’ve been using Tailwind for a while now, and their analytics are by far the most comprehensive. In addition to seeing general stats on your pins, you can also discover trending content, get insights on competitors, and track what’s being pinned from your site. They also have a bulk upload feature, the ability to schedule repins, and a platform for sharing the work with team members. All of these great features, combined with the fact that you can also post to Instagram, makes this a great tool to manage your visual content. 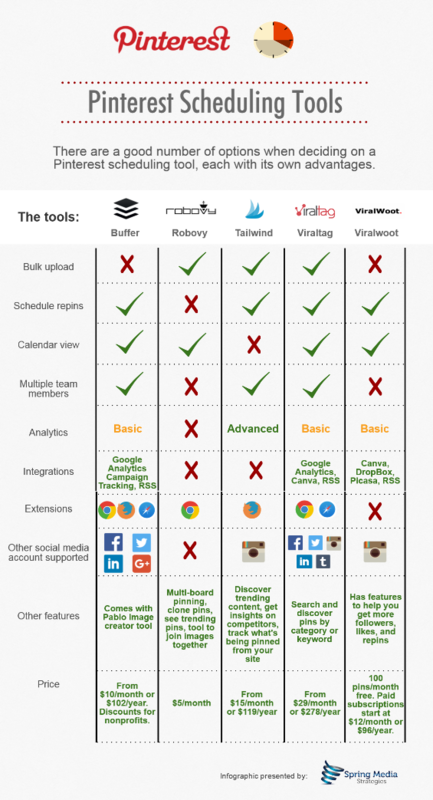 If you’re looking for a tool to manage all your social media accounts in one place, Viraltag is a great option. 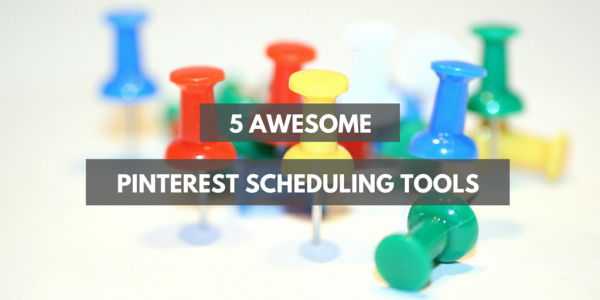 In addition to Pinterest, also schedule to Facebook, Twitter, LinkedIn, Tumblr, and Instagram. 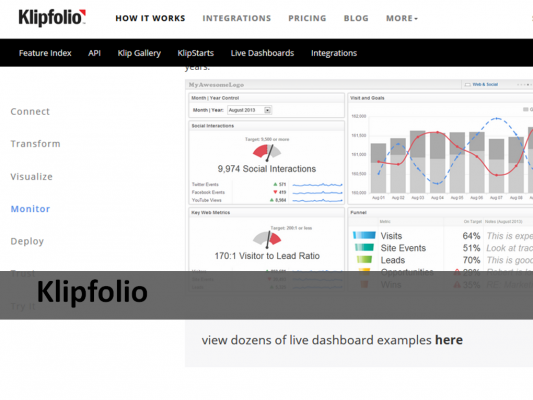 They recently released new features including bulk upload, analytics, and integrations with Google Analytics and Canva. If you had previously overlooked this tool because you were looking for more features, it’s time to give it a second chance. Plans are a little more pricey starting at $29/month, but they have special pricing for bloggers and nonprofits. If you write an honest review about their product you can get 60% off pro plan. Schedule up to 100 pins per month for free, which is likely more than enough for most nonprofits and small businesses. They have a free bookmarklet you install on your browser to schedule pins, or search Google images to pin within the website itself. To upload images directly into the scheduler or to schedule pins from Facebook, you’ll have to purchase one of their paid subscriptions, which start at $8/month. ViralWoot is also a platform that can help you get more followers, likes, and repins. They also offer some basic analytics and Instagram scheduling. Infographic updated on January 19, 2016. 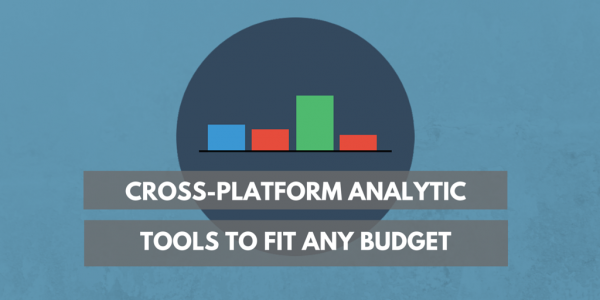 You don’t need a budget to get started analyzing your tweets and followers. To help you navigate the world of Twitter tools, I’ve scoured the web to find the ones that are the most useful. This is by no means an exhaustive list of analytic tools for Twitter, but these are some of the best ones I’ve found so far. All the tools in this list have at least some features available for free. When you’re just starting out, that’s usually all you’ll need. When you become a more advanced user, upgrade to the paid versions if you want to dig deeper. It’s unlikely that one tool will meet all your needs, so try out a few and see what works for your style and goals. This is a powerful visual tool that helps you map your networks and explore networks for other users or hashtags. To have more than three active maps and to analyze more than 1,000 tweets/month, upgrade to paid plans starting at €49/month. Use this tool to see very detailed information about your followers such as social authority, location, most active hours online, follower and following counts, account ages, recency of tweet, percent tweets with urls, retweets, bio word cloud, and more. A few features are available for free; try the pro version free for 30 days then it’s $99/month. Use Klear to get demographics of your followers (gender, influence, locations, interests), find influencers in any field, and analyze activity of related accounts. Some free features can get you started; paid plans start at $99/month. Hint: The monthly subscription is out of the budget for many small businesses and nonprofits, and at first glance it doesn’t seem like there’s a lot of information that you can get for free. On the bottom left of the homepage you can search a name or screen name. This is where you can find a lot of useful insights for your own page as well as others for free. 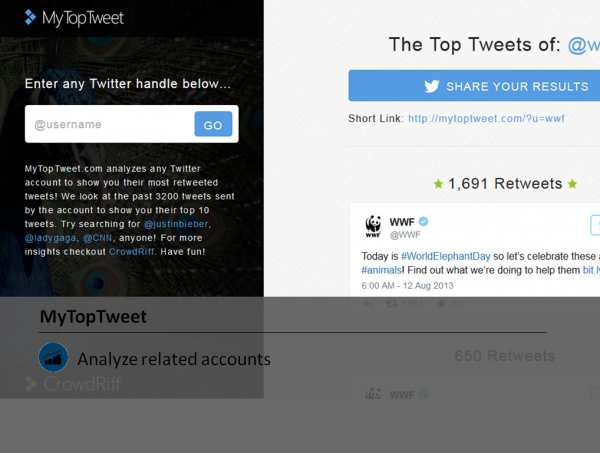 This is a simple free tool to find the top 10 tweets for any Twitter account. A great tool for quick and easy audience research. 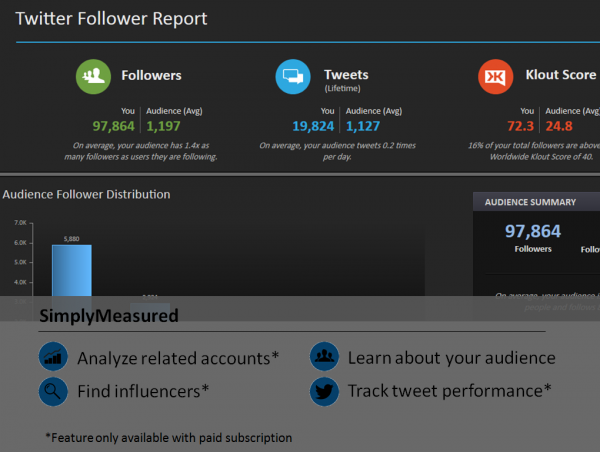 Use this tool for free reports on Twitter your followers including top keywords, Klout scores, Klout topics, time zone of your influencers, and more. 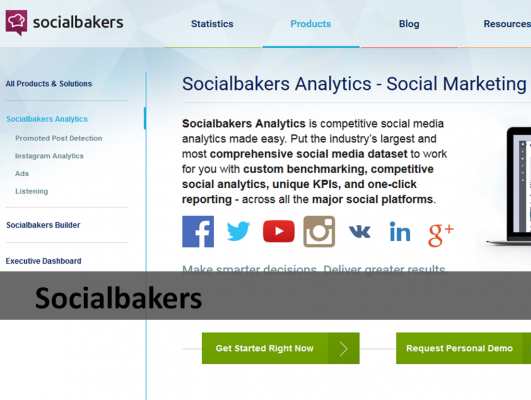 They also have several other free reports for other social media channels. Monthly subscriptions for premium reports start at $500. Their newsletter has a lot of useful tips and guides and is worth subscribing to even if you don’t use their services. 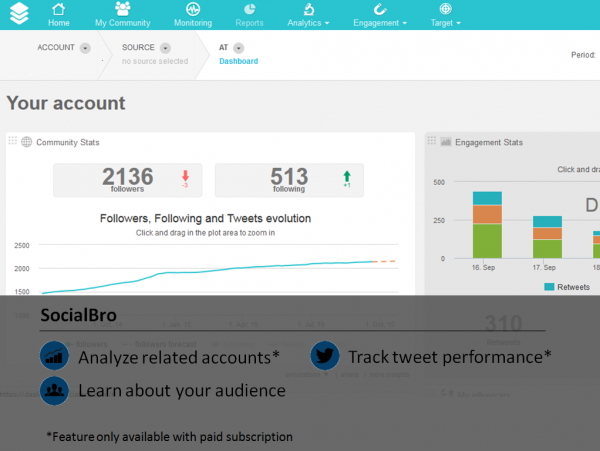 Analyze your own tweets, find users interested in any topic, and filter your searches by a wide range of options to zero in on your target audience. 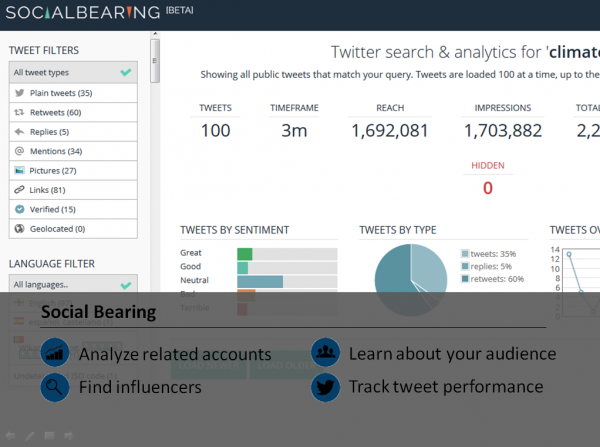 Social Bearing analyzes the sentiment of tweets, so that’s one unique feature to test the tone of your content. 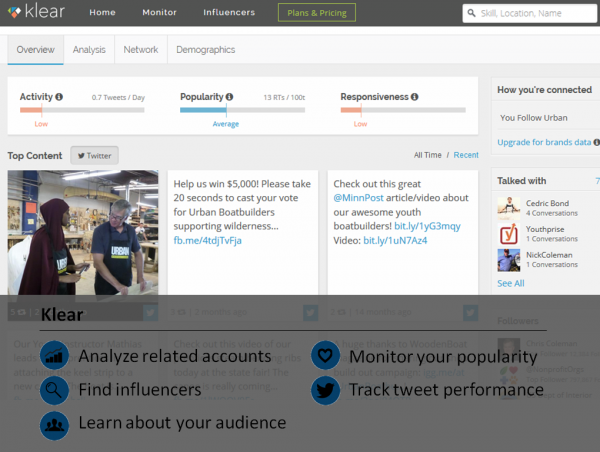 This is a powerful tool to find influencers to target. 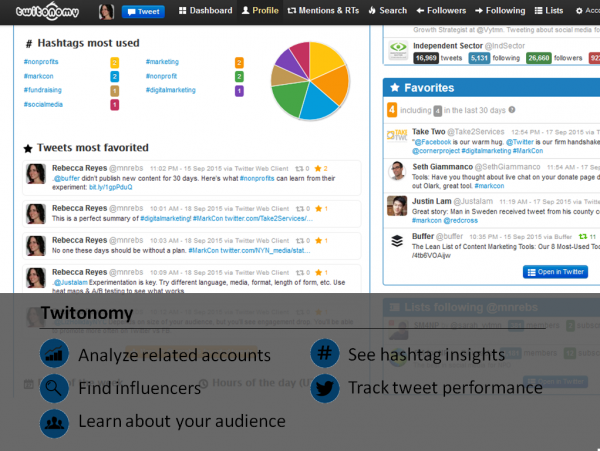 Find the best time to tweet, see community insights, and manage the accounts you follow. 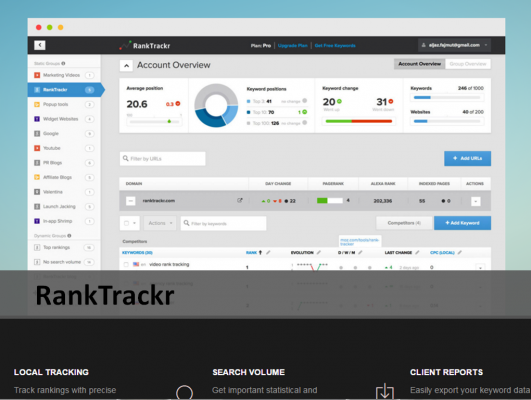 Unlock additional features such as analytics of your tweets, import email addresses, and automate Twitter tasks starting at $13.95/month. 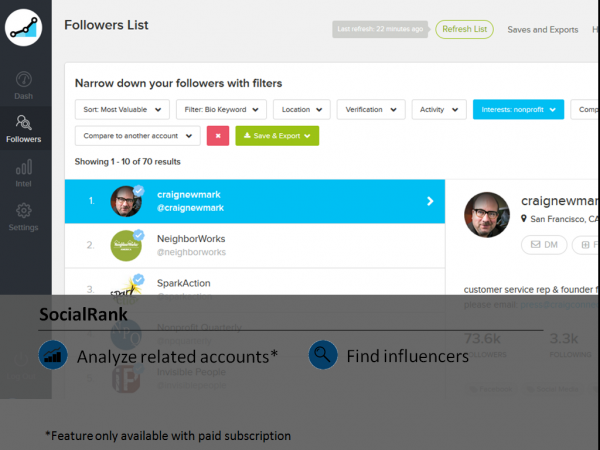 Filter and sort your followers using this tool to find influencers. Upgrade to analyze other accounts, and paid plans start at $49/month. 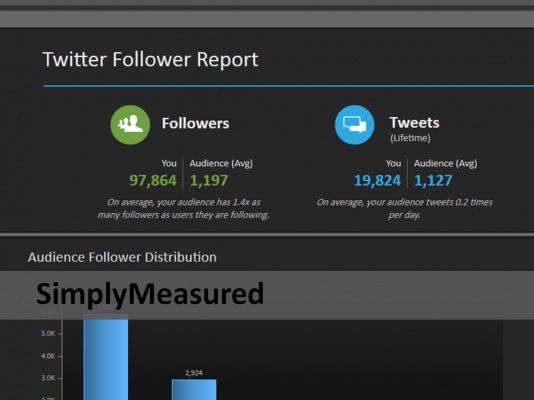 Use this tool to get insights on your followers. The best feature is that it lets you know at what times most of your followers are online and it syncs with your Buffer account to send out tweets when your followers are online. 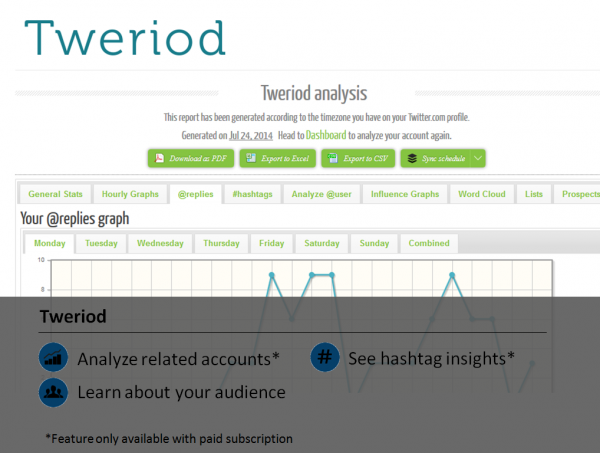 You can also graph times of the day you received @replies, research hashtags, analyze individual Twitter users and users from your lists, generate word clouds people following you are talking about, and more. A few features are free and monthly subscriptions are based on the number of followers and are very affordable, starting at $3.99/month. Tweriod can be a little buggy sometimes, but I think the synchronization with Buffer is worth the subscription. 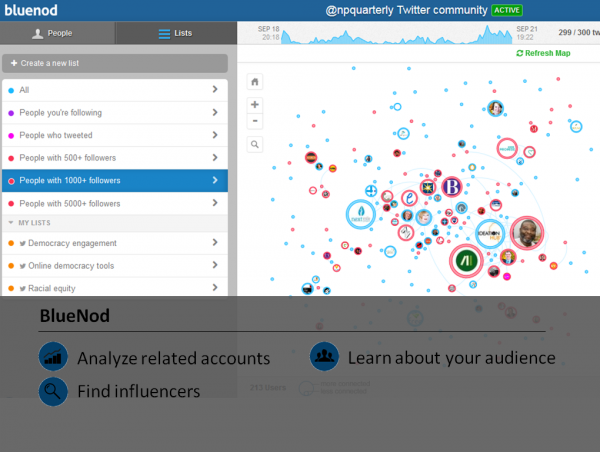 Use this tool to analyze your Twitter activity and interactions, identify your power users, see insights on your lists, customize your analytics dashboard, and more. 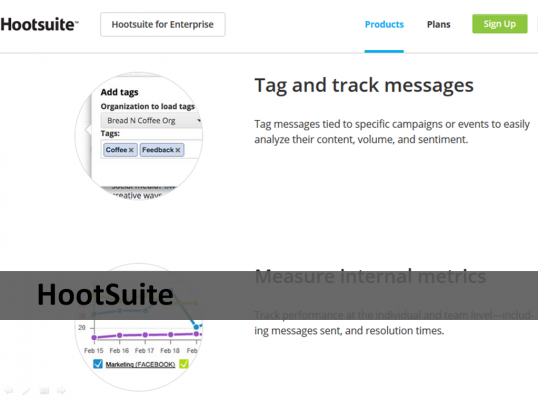 Upgrade for premium features like insights on hashtags, analyzing other users, and to download analytics reports. Premium plans start at $19/month. 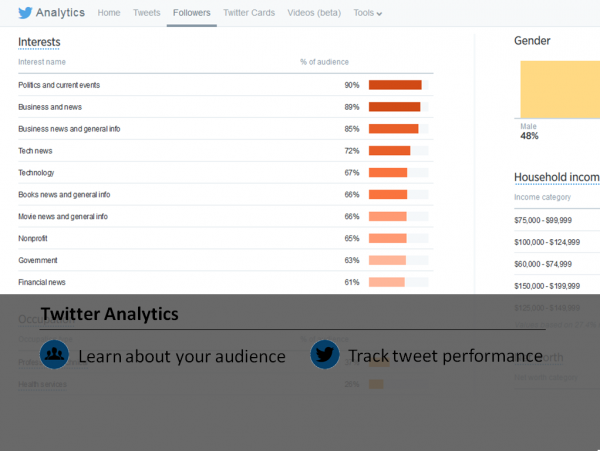 Twitter has some very useful analytics that come with the platform, 100% free, that will hep you monitor impressions and engagements for your tweets. You’ll also be able to dig into some very sophisticated information about your audience including mobile device type, household income, occupation type, education, marital status, consumer buying styles, political party affiliation, and more. 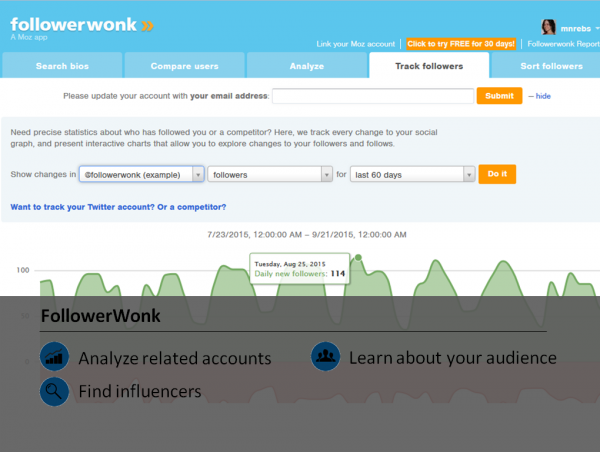 Compare audiences for your followers, your organic audience, your campaign audiences, and all Twitter users. Also, browse upcoming events on Twitter to help you plan how you can engage in popular conversations. Mobile is here to stay. If your site isn’t optimized for mobile you’re not only losing out on visitors, but also potential subscribers, volunteers, and donors. There are many mobile-testing sites out there and these are my favorites. 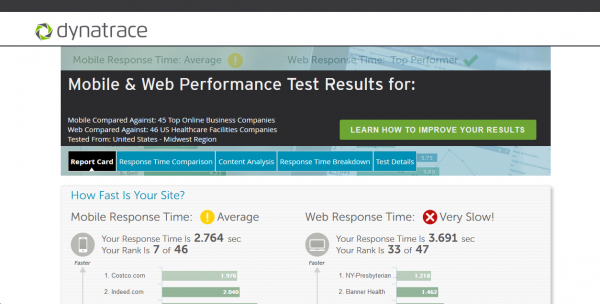 These free tools can help you identify and prioritize ways to optimize your site for mobile. While these tools can give you an idea of how your website might look on different devices, there’s no substitute for actually trying out your site on real phones and tablets. I’ve found that some elements look the same on these test sites as they do on my phone, and some are quite different. Use these tools as a resource while you’re building a site, but be sure to test the final product on a few mobile devices. Three of these eight tools are by Google. If you’re trying to improve your SEO, you care the most about how your site ranks in Google so it makes sense to use their tools. 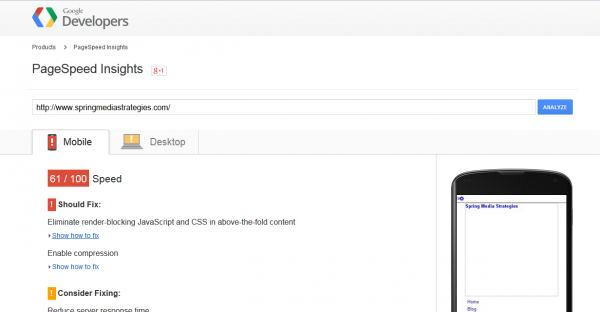 This is a quick and easy test to verify if your website is mobile-friendly. Just plug in your web address and wait a few seconds for the results! You don’t need to go to a separate website to check how your website will look on mobile devices. When you’re using the Google Chrome browser, press Ctrl + Shift + C (or Cmd + Shift + C on a Mac). Click on the mobile device icon and select the device you want to test from the drop-down list. This is a quick and easy test that’s useful when you’re building a site or when you want to show someone how your mobile site looks on a moment’s notice. The only downside is that you can’t see how the site looks when you rotate a mobile device. This is a simple, user-friendly tool to see how your site looks on various devices. Use the “My favourites” feature to bookmark the top mobile devices people use to access your site. Test how your site looks on desktop, tablet, mobile, and TV. You can generate a link to easily share the results. 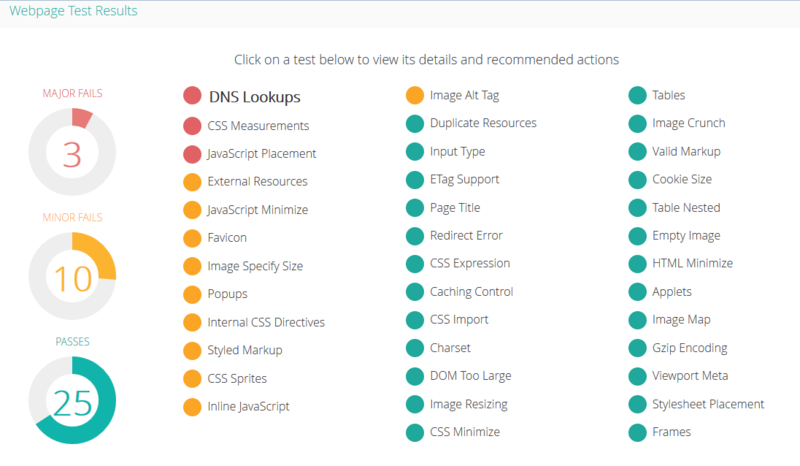 They also have tools to help you build sitemaps and wireframes. Use mobiReady to test multiple sizes of mobile devices at once. Compare your site to the top 1000 Alexa sites to see how “mobile ready” it is. MobiReady also gives very specific recommendations so you can see what needs improvement. The World Wide Web Consortium (W3C) is an international community that works with organizations and the public to develop web standards. They have a handy mobile checker that will give you specific recommendations on how to make your site more mobile-friendly and let you know which changes are a top priority. Use Google’s tools to test the speed of your website for both mobile and desktop. Also get specific recommendations to help you increase your speed. Everyone loves to share infographics. They’re a great tool to get your message across quickly in a way that’s easy to understand. While hiring a pro is ideal, sometimes you have a tight budget or a short time frame and working with a graphic designer isn’t always possible. That’s where these tools come in handy. All you need is some compelling information and an eye for design in order to create beautiful infographics on your own. Use this tool to create beautiful infographics, reports, banners, or presentations. Start from a blank template, use one of their free templates, or upgrade to pro themes. Use their graphics or import your own in their drag-and-drop tool. Get access to the best features for $29/month. This easy-to-use web tool helps you visualize many different kinds of concepts and ideas. While it does have some chart tools, I think this tool is better suited for other kinds of visualizations. The free account includes 60 images and 10 fonts. Upgrade to pro for only $3/month. This desktop app is great for visualizing data sets. Infographics using their free version can be shared via email, Twitter, Facebook, LinkedIn, Google+ and/or embedded on your site. Upgrade to save it on your own computer and to integrate with more data programs. This tool has a lot of chart options and is great to work on projects with a team. 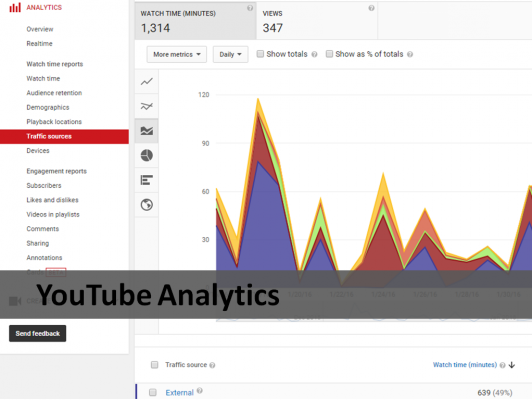 Integrate with Google Analytics and Google Sheets to create infographics, charts, and maps. Upgrades from the free account start at $15/month. This web tool has a lot of sophisticated templates for the user that’s looking for more advanced features to really customize your content. There are free templates and icons available, and premium plans start at $19/month.